Small is the new BIG! The perfectly Abstract Adder day in Frankfurt Germany! Hello everyone and welcome to Adder World, it is a fine Sunday morning and the sun is shining brightly outside—at least in this part of the world. Yesterday my wife and I had a unique and wonderful day in Frankfurt, Frankfurt Germany! We went to Frankfurt for a reason, a very special reason and I am going to tell you a little about that and I am going to tell you of a few things we discovered in Frankfurt which related perfectly to my Adder nature and how things just seemed to happen that I wanted to happen, but I wasn’t really thinking of happening—at least not in Frankfurt Germany. Ah, the Law of Attraction with Positive Thinking and the Power of Optimism does incredible things and it works. If you have been reading my Blog, then you know what I am talking about. This is going to be a rather long article today, so, I recommend getting a nice, pleasant cup of coffee or tea and settling in for an Adder story of Inspiration, Motivation and Optimism… are you ready? Then let’s go… if you like you can count the type-O’s, because I won’t remove them or even consider them—I am in the perfect Adder mode of Hyper-Focus and I don’t have anywhere to be for, well, the whole day—I am yours! The reason Joan and I traveled to Frankfurt was the Schirn. Have you heard of it? It is a world famous Art Exhibition Museum in downtown Frankfurt and the current art exhibition is of interest to my wife (and now me)—as I have mentioned before, my wife is an Art Buff—she loves art, especially abstract art. The current exhibition is: TURNER HUGO MOREAU THE DISCOVERY OF ABSTRACTION. I admit I personally was not that interested in this art exhibition; however, I was very interested in seeing my wife enjoy what she loves. I also love it when I do and see things new to me and yesterday I discovered a pleasant and amazing surprise that abstract art is very interesting to me too and it played a bit with my mind. It’s not easy to get my attention; you know that and this art form captured my attention—I even got in trouble by one of the room monitors for getting too close to one of the displays! Jeeze, we Adder’s just can’t seem to stay out of trouble. Joan got scolded too, so I don’t feel so bad… these folks take their art very seriously and with good reason. When I think about it, abstract art… hrmmm… let me think about that word for a moment ‘abstract’. What do I always praise about our Adder minds? Oh, that’s right, our ability to think in unique, ingenious, creative and oh, abstract ways! Go figure! Yesterday was a very busy day in downtown Frankfurt, it was very difficult to make our way through the crowds and many times we found ourselves ducking into stores just to catch a breather. The Schirn Art Museum was also very active and it wasn’t easy to stand around and just enjoy the art—besides, we had gotten in trouble. We decided to leave and come back when there would be less people. The Abstract Art Exhibition is on display through January, so we are going to go back on a day during the week and not the weekend. Good idea, not that I thought of it before this Saturday though. Ah, but all was not lost and we did enjoy the exhibition, no matter how limited our time was. As we made our way through the crowds of people on the downtown walkways of Frankfurt one of the stores we happened to duck into was a Godiva store. Oh treats! This wasn’t so bad a visit, we decided a few chocolate covered strawberries would make the day of crowds that much more enjoyable—who can’t make it through the crowds of Frankfurt in a chocolate delirium? Yep, that certainly helped. So far so good, we went back out and made our way through the crowds for a few more blocks and then we happened on to an Adder’s favorite store of stores: STARBUCKS! Oh joy! If you really want to get your focus-ON then I recommend Starbucks and no, Starbuck’s didn’t pay me to say that (write that) – ha and as a matter of fact nobody pays me for anything I mention on this Blog of mine—it’s all free-free-free—for now anyway, well, I get paid in love and adoration! Really, it’s true—I am rich with love and adoration—give me more! But, no money please, at least, not yet. I am having too much fun the way things are! 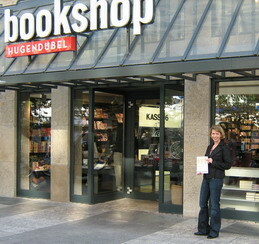 That brings me on to an exceptional find in downtown Frankfurt—I took pictures, so you will know I am not making it up! My wife and I found a bookstore with books in English and we both found books that we decided to purchase and that was the tipping point of our day and you know what? It’s all because of the overwhelming influence of crowds! For those of you have read my Positive Thinking articles you will know that I was assisted in creating my Blog by reading Seth Godin’s Blog! I have downloaded his PDF books, listened to his Audios and now I have purchased one of his books in a bookstore in downtown Frankfurt Germany and what’s more: it’s in English! I just could not believe I found his book “Small is the new big” in a German store—(where I didn’t expect to be yesterday). Seth Godin has taught me a lot and whether he realizes it or not he teaches in an exciting manner which is perfect for us Adders. If you haven’t checked him out—I mean, if you haven’t checked out his writings, work or anything he has done, I highly, highly suggest that you do! Many of you have written to me asking for book recommendations and most expect me to recommend books about ADD ADHD, but really, I don’t have many books about ADD ADHD that I would recommend to Adders. That might seem odd and before I get too far off track, let me just say I will put together a list of books which I have found helpful in my next article. For now, it’s about Seth Godin. When I spotted his book—how could I not spot it, I mean look at the cover, no Adder could pass that cover by and not go “huh?”! Oh, by the way, I mentioned this specific book in Positive Thinking part4 post1. Believe in Positive Thinking and the Law of Attraction now? We get what we think of the most, so it’s best when we make those thoughts positive ones… smile! I just want to throw in here and I hope Seth doesn’t mind—I wrote Seth about my Article that mentioned him and he personally checked it out and wrote me back telling me that it was cool! Take a moment to think about that—Seth is a very busy infamous person who has one of the most popular Blogs on the internet, he has written bestselling books and he has assisted other world famous important people with their endeavors and he took a few minutes to check out my site and write back to me! How cool is that? I think it speaks clearly what this man is about and that’s being there for other people and taking time to make connections. Okay, enough of that, let’s get to the meat and potatoes… That Adder World is becoming a premier Blog for ADD ADHD folks to read and relate to? Yeah, that is fantastic if I say that, but really I want to talk more about our trip to Frankfurt—yes, it’s partly your trip now too! After the book store and our… uhm… good luck? We decided it was time to head out of town and make our way back home. Oh did I tell you that Joan and I are Americans visiting Germany? Okay, well, I am telling you now and that’s a whole other story—long story, but fantastical in of its self. Yes, one day we will be back home in the good old USA, but for now I am at the part where we are getting back in the car and driving home. When we finally arrived on the autobahn taking us away from Frankfurt my loving wife decided to read a bit from Seth’s book. She had not read anything of Seth Godin’s before and she was just being nice to read a little in the car and help pass the time—did I mention she has a wonderful voice which is perfect for reading? No? Well, now I did. This trip was just getting better and better, even in the car heading home. I mentioned how I discovered something new by learning about abstract art and finding it very interesting, well, (I like the word ‘well’) Joan found Seth’s book very interesting too and she loved an article in his book called “Artists care about the art” I am just glad she didn’t say turn the car around and head for the airport, because we had just passed the Frankfurt AM airport and it’s tough finding an exit to turn around once you’ve passed it. Yep, I think it’s amazing she didn’t make me take her to the streets of SoHo to buy art in NYC! Seth, please be careful with those articles—you might not be sure of what we can do with that story, but I assure you my wife can find something to do with it and yes, she did want to hear it! Nice! That’s it for today. I hope you have enjoyed reading about our trip and whenever you get the time do check out some abstract art and give Seth’s book a read while drinking some Starbuck’s ‘focus’ latte! I don’t know if that’s a real drink or not, but it works for me! I call mine doubleshot.